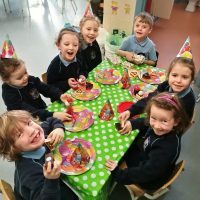 Fáilte romhat chuig ár suíomh scoile. 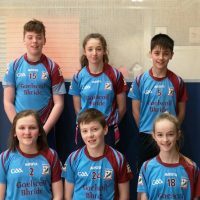 Tá súil againn go dtabharfaidh sé blaiseadh d’ár scoile daoibh. Is gaelscoil sinn, suite faoi scáth Staid Semple. 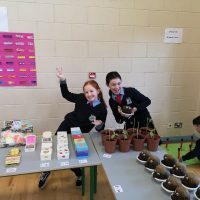 Scoil mheascaithe a bhfuil Gaeilge agus cúltúr na Gaeilge mar chroílár na scoile. 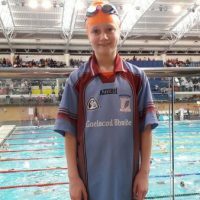 ‘Sí an Ghaeilge teanga teagaisc is cumarsáide na scoile. Bímid ag súil le hard – chaighdeán béasaí is iompair agus spreagtar na daltaí chun meas a léiriú ar chách trí atmaisfear dearfach, aireach a chruthú. Déantar gach iarracht freastal ar riachtanais gach páiste agus gach deis a thabhairt dóibh a gcumais a shroichint. You’re very welcome to our school website. We hope it gives you an insight into our school and what we engage in with our pupils. We are a mixed school of over 220 pupils, nestled under the shadow of the hurling mecca that is Semple Stadium. Irish and our Irish culture are at the very heart of life here in Gaelscoil Bhríde, Durlas. Irish is the medium of instruction and also the day to day language of the school. We expect a high standard of behaviour and manners and all pupils are encouraged to show respect to all, through a caring, positive and supportive school environment. We endeavour to support the needs of all pupils in helping them to reach their potential. Click below to learn more about enrolling in our school. See all the latest information from the parents council.